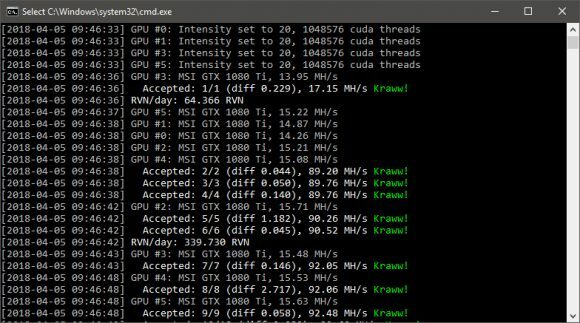 There are already a number of forks of ccminer available for Nvidia GPU miners interested in mining Ravencoin (RVN) that uses the new X16r algorithm, but they are more generic in terms of algorithm support, while the Ravencoin Miner (source)tries to focus on RVN. The idea is to make user experience while mining Ravencoin better and not only focus on performance by providing a good hashrate. 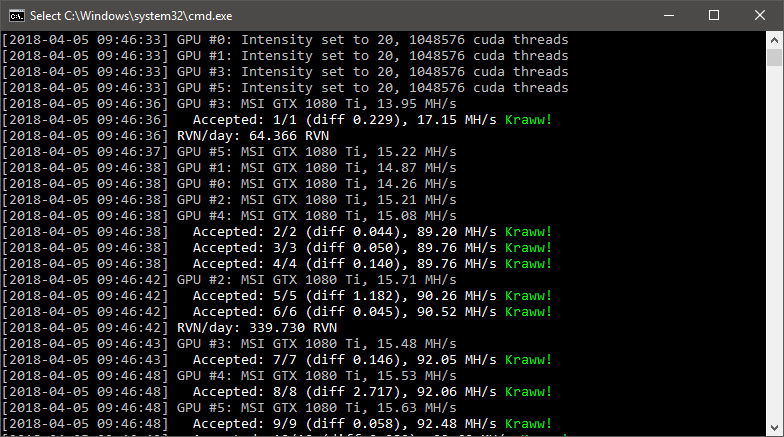 The latest few updates are making the output displayed by the miner more useful for the miners and we especially like the function that estimates the RVN earned per day based on the hashrate that the miner achieves on your rig as well as the Kraww! instead of yay!. The Ravencoin Miner is open-source fork of ccminer with support for X16r, it can be compiled on Windows and Linux. Do note that the official Windows binary release available for download does come with 1% developer fee activated by default, so you can support the developer while mining. If you want to can disable the developer fee with by adding the command line option --donate 0, so no need to recompile from source with zero dev fee. Since we like what we see with the development of this miner though we would prefer to leave the developer fee on and support the further development of the miner and you might want to do the same.